In Pic : The turtle-like growth on eight-year-old Maimaiti Hali's back. 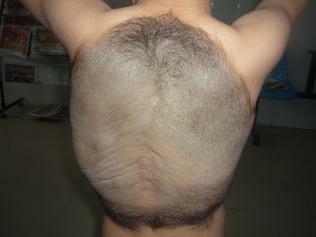 A YOUNG boy with a shell-like growth on his back has had life-changing surgery after he was dubbed "turtle boy" by cruel bullies. Eight-year-old Maimaiti Hali had the growth removed by surgeons in a miracle two-hour operation, The Sun reports. Doctors at the Urumqi Military General Hospital in China's Xinjiang province said they had used skin grafts from the boy's scalp and legs to replace the removed growth. Dad Maimaiti Musai said: "We were told surgery wasn't possible when he was very young so we waited. But the growth got bigger and harder and became like a turtle shell. "People bullied him and we were determined to end it. He is such a good and brave boy and he never complained. We are so glad that he is now on the mend." In Pic : Eight-year-old Maimaiti Hali has life-changing surgery to remove a turtle-like growth from his back. Chief surgeon Ye Xiangpo said: "The skin we removed was as thick as a bull's hide. "We used scalp hair on the graft because it grows back very quickly. We expect him to make a full recovery." Mainmait, from Heping, northern China, said: "It was a bit painful, but I won't worry about other kids laughing at me any more. "I am looking forward to going out in the sun without my shirt on and to going swimming with my friends." Baby Jumping Festival.. WTF Is This ?